Our Little Mimi had gone into the kitchen to make herself a mid-day snack. She had tried her best to get me to make it for her but I was very busy playing Bejeweled doing some Very Important Things and told her to make it herself. After much grumbling she finally stomped her way to the kitchen and started banging things around. Now smear, smear, smear…lick the spoon…beans, yummy beans. It’s time for cheese, we like cheese…sprinkle, sprinkle, sprinkle. Leave it open, pop in in the microwave for two minutes. Now clean up my mess. 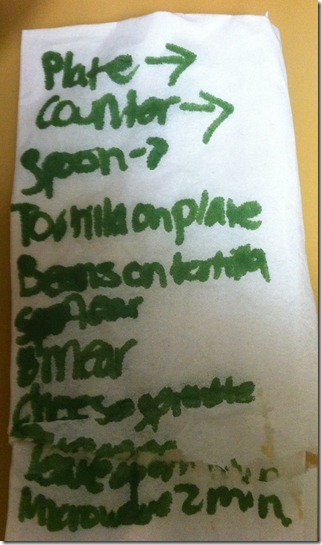 By the time Mimi had gotten to the plopping part, I knew that she was making a bean burrito. She had asked me to show her how I made them because according to her, mine always tasted better than anything she ever made. Naturally when showing her the very complicated step-by-step instructions to make my special bean burrito, I had to jazz it up a bit by making sound effects. The sound effects seemed to have made a huge impact on Mimi as she diligently took notes on them…and repeated them when she made her own burrito. This entry was posted in Cooking, Food, Humor, Mimi, NaBloPoMo and tagged burritos, Cooking, mother, taking note. Bookmark the permalink. Ah! Cooking by Meggie, oh so fine! Your kids are going to be one step ahead of mine. They can’t make bean burrtios. They can make ramen though. A big bowl full of sodium. And hey, do not apologize for your comment on my blog. I didn’t think you were whining! And I totally feel you. What do you serve vegetarians on Thanksgiving? Good luck!